Libraries empower people to find success in reading, in school, in the workplace and beyond. But this can only be possible if Libraries themselves are strong. This is why the County Library service is asking community groups, Heritage and Tourism organisations and the general public for a letter of support to help dramatically reshape the Library service in Youghal. 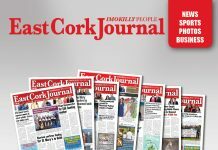 Cork County Council last year gave the go ahead for plans to develop Collins Bakery on North Main Street Youghal into a state of the art Library service to attract more people and events. The new Library will be built around the fabric of the 17 Century building at 58-60 North Main Street, as the site is in an architectural protected area. The Library service applied for grant aid under the Government Rural Regeneration Programme in 2018, to carry out a number of surveys on the building prior to the commencement of works, but failed to attract funding. Acting County Librarian, Bernie Wallace, told the April Sitting of the East Cork Municipality that this year she is determined to be successful, as the project is vital for Youghal. All new Libraries are now open in the evenings under the new Open Libraries initiative. She said Youghal is a magic place for young people “there’s the beach, the tower, the heritage buildings and all the magic that surrounds it for a child, but it needs a Research, Culture facility and Visitor Centre to bring it all together, as not every day is sunny”. Emails of support can be sent to Bernie.Wallace@CorkCoCo.ie or by writing to Bernie Wallace Library Building, Carrigrohane Road, Cork.